TN SHERIFFS’ ASSOCIATION EXEC. DIRECTOR TERRY ASHE SAYS THE FARM WATCH PROGRAM THAT BEGAN IN DYER COUNTY IS AN IDEAL PROGRAM TO GO STATEWIDE. 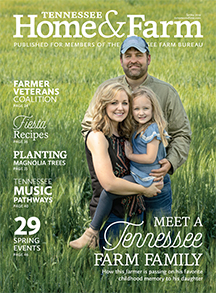 SINCE 2002 MORE THAN 150 WEST TENNESSEANS INVOLVED IN THE AG COMMUNITY HAVE BENEFITED FROM WHAT’S KNOWN AS THE AG STAR PROGRAM. A NEW ECONOMIC ANALYSIS BY THE AMERICAN FARM BUREAU SHOWS A MAJOR TRADE AGREEMENT NOW BEFORE CONGRESS WILL INCREASE FARM INCOME AND EXPORTS. THE AMERICAN FARM BUREAU SAYS THE SENATE GMO LABELING BILL WOULD BENEFIT CONSUMERS AND AGRICULTURE. THE FUTURE CONTINUES TO BE BRIGHT FOR AG AND RURAL TENNESSEE IF THE RECENTLY HELD TN YOUNG LEADERS CONFERENCE IS ANY INDICATION. DR. STEVE MEYER GAVE FARM BUREAU LEADERS A LIVESTOCK AND POULTRY OUTLOOK LAST MONTH DURING THE AFBF CONVENTION. THIS PAST WEEKEND YOUNG FARMERS FROM ALL CROSS THE NATION GATHERED IN KANSAS CITY FOR THE ANNUAL NATIONAL YOUNG LEADERS CONFERENCE. A RECENT ANNOUNCEMENT DEMONSTRATES THE DIVERSE SUPPORT AND SCOPE OF USDA’S REGIONAL CONSERVATION PARTNERSHIP PROGRAM. AFBF PRESIDENT ZIPPY DUVALL MET WITH YOUNG FARMERS & RANCHERS FROM ACROSS THE COUNTRY GATHERED AT THEIR NATIONAL LEADERSHIP CONFERENCE IN KANSAS CITY. ROBERT ELLIOTT OF ROBERTSON COUNTY WAS RECENTLY ELECTED TO SERVE AS CHAIRMAN OF TN’S YOUNG FARMER AND RANCHERS’ STATE COMMITTEE. THE TEAM EFFORT OF THOSE BEHIND A SCHOOL ACTIVITY AND NUTRITION PROGRAM WAS ON DISPLAY AT SPORT’S BIGGEST STAGE. JENNIFER HOUSTON CONTINUES HER PASSION OF SERVING THE BEEF INDUSTRY. DURING THE NCBA NATIONAL CONVENTION SHE WAS ELECTED AS CHAIRMAN OF THE POLICY DIVISION. TENN. CONGRESSMAN IS CONFIDENT IN SERVING RURAL PEOPLE IN HIS ROLE ON THE HOUSE AG COMMITTEE. LAWMAKERS GET UPDATE ON FDA’S NEW REGULATIONS ON THE VETERINARY FEED DIRECTIVE. TN AG COMMISSIONER JULIUS JOHNSON GAVE TESTIMONY TO THE SENATE TRANSPORTATION COMMITTEE ON THE IMPORTANCE OF MAINTAINING OUR RURAL ROADS. THE AMERICAN FARM BUREAU FEDERATION WANTS TO HEAR FARMERS’ THOUGHTS ON BIG DATA. SENATE MAJORITY LEADER MARK NORRIS SAYS GOVERNOR BILL HASLAM WILL SPEND PART OF HIS STATE-OF-THE-STATE ADDRESS FOCUSING ON RURAL ECONOMIC DEVELOPMENT. STATE SENATE MAJORITY LEADER MARK NORRIS OF COLLIERVILLE IS IN HIS 16TH YEAR IN THE TN GENERAL ASSEMBLY. WINTER IS FINALLY HERE, AND THAT CAN BE DANGEROUS FOR NOT ONLY US, BUT ALSO OUR PETS. THE AGRICULTURE AND NAVY SECRETARIES WITNESSED THE DEPLOYMENT OF THE FIRST FLEET OF NAVAL VESSELS USING BIOFUELS IN THEIR REGULAR OPERATIONS. AFTER RECORD WARMTH, LIVESTOCK MAY NOT BE FULLY ADAPTED TO THE SUDDEN COLD AND MAY NEED EXTRA HELP. SHOULD ALL FOODS CARRY A LABEL TELLING US THEY HAVE GENETICALLY MODIFIED INGREDIENTS? FARM SPECIFIC TECHNOLOGY OF WEST TN WINS FARM BUREAU’S PEOPLE CHOICE AWARD IN RURAL ENTREPRENEURSHIP CHALLENGE. USDA TO BROKER TALKS ON GMO LABELING THIS WEEK. GEORGIA’S ZIPPY DUVALL BECOMES 12TH PRESIDENT OF THE AMERICAN FARM BUREAU FEDERATION. TENNESSEE YOUNG FARMERS WERE VERY SUCCESSFUL IN NATIONAL COMPETITIONS AT THE AMERICAN FARM BUREAU CONVENTION. THOUSANDS OF FARMERS FROM ACROSS THE COUNTRY ARE GATHERED IN ORLANDO FOR THE AMERICAN FARM BUREAU’S 97TH CONVENTION. 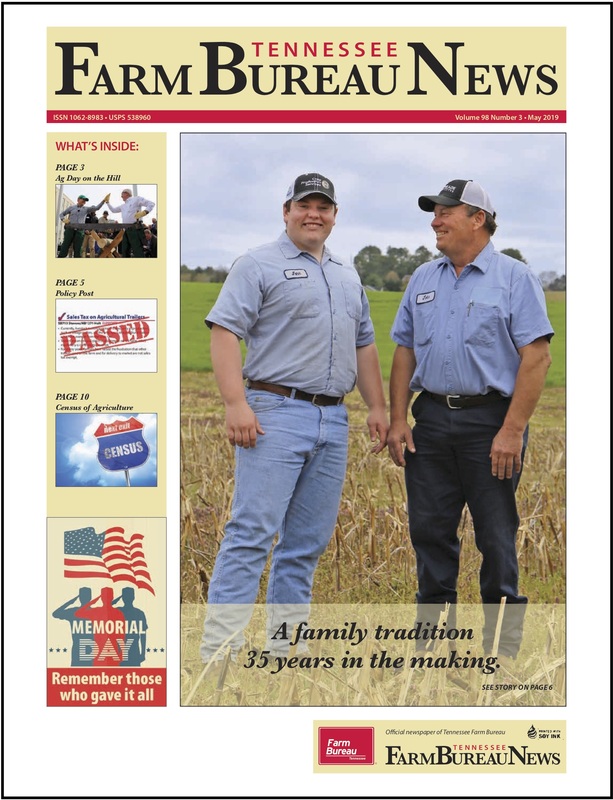 WHAT WILL THE NEW YEAR BRING FOR FARMERS IN THE FARM ECONOMY? AG SECRETARY TOM VILSACK PROCLAIMS JANUARY 6 AS BOB STALLMAN APPRECIATION DAY AT USDA. UTILIZING A FARM ENERGY AUDIT FOR YOUR BARN, SHOP OR CO-OP CAN HELP CREATE COST SAVINGS THROUGH MORE THAN JUST GREATER EFFICIENCY. A VERY UNUSUAL WEATHER YEAR AND A LOT OF RAIN IN DECEMBER AND FLOODING PROBLEMS ALONG THE MISSISSIPPIT AND THE TENNESSEE RIVERS. WAMPLER’S FARM SAUSAGE COMPANY CONTINUES TO IMPLEMENT TECHNOLOGY TO REDUCE ENERGY COSTS.